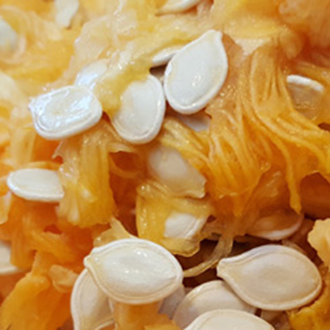 While we’ve investigated the impact of removing olive pits from the olive oil making process, we certainly wouldn’t advise you to toss out your pumpkin seeds when you’re carving your pumpkins for Halloween. Instead, toss them with some extra virgin olive oil or flavored olive oil and some quality sea salt for a delicious treat. Preheat over to 300 degrees F.
Rinse pumpkin seeds in a colander to remove pulp and pumpkin bits. Dry with cloth towel (paper towels may stick to pumpkin seeds making it difficult to remove paper from seeds). Place in large mixing bowl and toss with ample olive oil of your choice. Try experimenting with flavored olive oils. Season to taste with a quality sea salt or kosher salt. Spread the pumpkin seeds evenly on a baking sheet in a single layer. Roast in 300 degree oven for approximately 45 minutes until seeds turn golden brown, tossing them in the pan periodically. NOTE: Smaller seeds may roast quicker, while large seeds may take longer to roast.